present your ideas and projects, carry them out and analyze them more effectively? masterfully and visually communicate important messages? enhance meetings, project works and the creation of strategies? provide overview and shared understanding for teams and groups in all sizes? 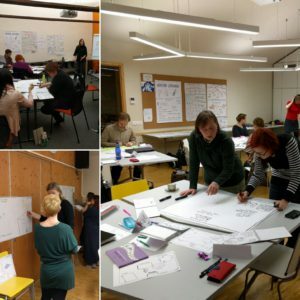 Graphic facilitation and visual thinking is a powerful practical methodology for people working in the field of leadership, coaching, consulting, training, education, youth work, children, facilitation, design, technology, project based work, IT and so on and so on… it is suitable for everybody. To sign up for this training you do not need to have any artistic background, but just be ready to doodle, scribe, and analyse a lot. 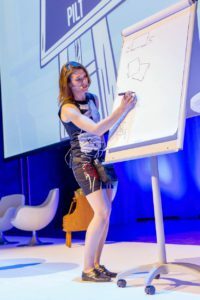 The main emphasis of the training is to encourage the participants to draw and use simpler drawing techniques in professional life. Additionally, we learn to piece the drawings together in strategic contexts, how a picture can support important texts and how to create complete visuals. 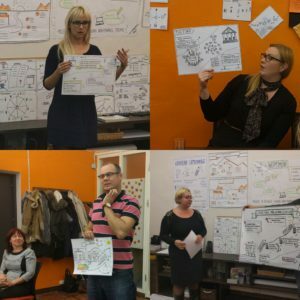 In this training we focus more on graphic facilitation in any professional context and a little less on graphic recording. This is a hands-on training which means that agenda includes lots of creative practical tasks. I give our best that the training would be relevant and directly applicable to your own work. Your trainer Kati Orav was born and lives in Estonia. She has been interested in teaching and leading since childhood, so, no surprise, that currently she is working as a trainer and process manager. She believes that creating right conditions, asking right questions and using supportive tools can help people to discover creativity and potential to make a change. 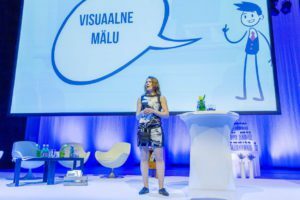 She’s been voted as one of the best speakers in one of the biggest Conference for leaders in Estonia. 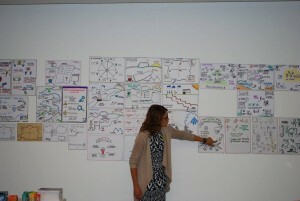 She also did the whole visual to this conference and graphic recording during the happening. She was also performing in TEDxTartu in november 2016.